Windows 7 includes a little-known new feature called Virtual Wi-Fi, which effectively turns your PC or laptop into a software-based router. 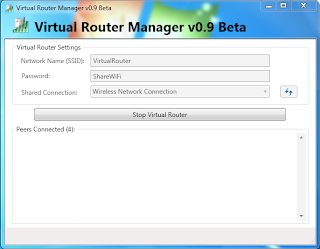 Virtual Router is an open source software based router for PCs running Windows 7 and its freely available for users. These devices connect to Virtual Router just like any other access point, and the connection is completely secured using WPA2 (the most secure wireless encryption.). By using Virtual Router you can establish most secure wireless access point without any cost. Absolutely Anywhere you can use it! Added ability to customize the icon displayed for a particular device / connected peer. To do this, either "double click" the connected peer, or "right click" and select "properties". Added Network Name (SSID) and Password Field Validation. SSID can not be longer than 32 characters, and Password must be at least 8 characters and no more than 64 characters. Persist SSID and Password across executions so that the user doesn't have to type it in every time. 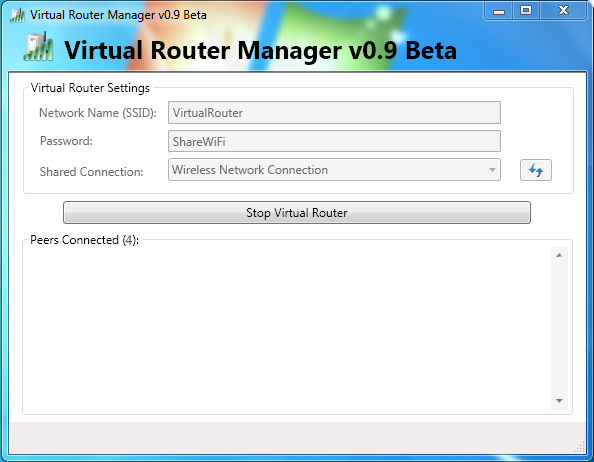 The First time Virtual Router Manager is run the Password/Passphrase field is blank. This is to encourage users to enter their own password instead of just using the "default" value in an effort to help increase the overall security. This way there is no "default" password for hackers to try connecting with. się teraz zastanawiac. Artykuł jest ciekawa, bardzo przydatny, bardzo mi sie podoba. Chcialabym juz moc przeczytac nastepny. To reset the waste ink error you will need to download a reset program. This resets the printer counters back to zero and the printer will work again as normal. You can download this reset program from our website. and I'm shocked why this coincidence didn't hsppened in advance!